If I were to make a list of the science fiction authors that the teenage me resentfully read out of a desperate longing for SF, any SF, Ray Bradbury would be near the top. I didn’t care for his fiction … but he was considered a respectable author, despite all the rocket stuff. That respectability, plus his slipshod approach to science, made him suspiciously literary to my eye. But it did mean that libraries, even libraries in small rural schools, could be counted on to have at least a few of his books. 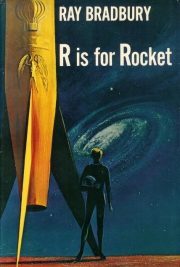 Take 1962’s R is for Rocket….